Become your own favourite artist. When you fall in love with watercolour, you start a journey into a world of vibrant colour, a liquid flow of magic that looks both effortless and complex. And if a loose and fluid style is what you crave, it seems like it would be so easy! It doesn't take long for most new painters to realize why watercolour has a reputation as "the hardest medium," and this can often feel like a reason to give up. If watercolour is so hard, why should you think you have what it takes to learn it? Watercolour can be mastered by anyone who loves it too much to quit. You can love every stage of the journey. You can paint the way you've always dreamed, and it will make your heart sing. You don't have to be gifted, or even very creative, to learn to make beautiful paintings. Spending time painting is a form of creative therapy that our souls crave. Angela Fehr is by far my favorite instructor. I watch her tutorials over and over and have learned so much. The way she handles her brush and applies the pigments is mesmerizing and her clear instruction is so nice to listen to it. She makes you want to paint! I am drawn to Angela's painting style because of the fluid, relaxing flow. I love to watch her videos and feel her love for this medium and respect her talent for teaching. She is clear with her instruction and generous with her knowledge. I look forward to more from this extremely talented artist and feel blessed to have discovered her. The internet gives us an amazing opportunity to choose the instructor, subject and direction that best fits our needs at any stage of our watercolour journey. I've focused on sharing strategies for developing your watercolour skills so you can paint to your best level, grow in your personal style, and problem-solve through the painting process, while emphasizing a loose & fluid, intuitive approach to the medium. I'm passionate about encouraging painters to trust the process and adopt attitudes that make every painting session joyful and soul-feeding. While I encourage raw beginners to start with the Basic Techniques, for students with more intermediate knowledge, you can choose any course that appeals to where you are looking to grow your skills. Click here for your customized recommendation! 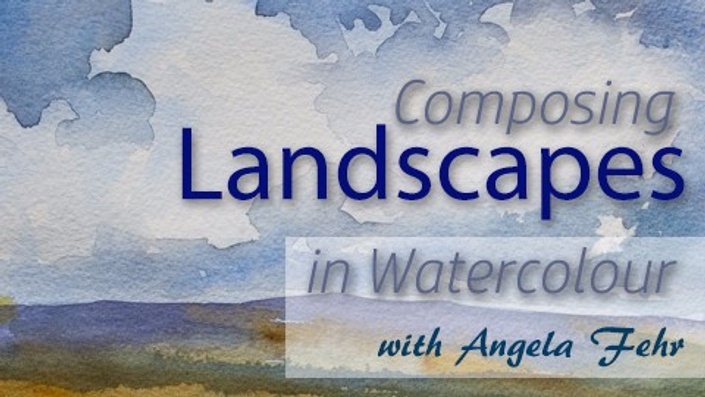 Angela is a great watercolor artist and very competent teacher. Watercolor is a media difficult to master. She knows how to pass important information, her explanations are clear and easy to follow. I have been learning watercolor only from watching videos, her tutorials are the best I have followed. Angela painting corresponds exactly to the style I want to express: fluidity. I have always painted detail, but my desire is to paint “feeling". This class has shown me how to “think" and plan. I've never know how to use a photo, but now I can try it because of Angela's instructions. The lessons are very informative and they inspired me to try loose painting techniques and to try to get a mood and feeling in my artwork. I look forward to trying to accomplish these things. I won't hold myself to perfection as I usually do, but rather, feel free and “express" my feelings in my art. I just wanted to let you know that, as far as I am concerned, your courses are the very best I have had access to on the Internet. I find them highly professional and I love your wet-in-wet watercolour technique. I also love your paintings : they are so colourful and beautiful ! I hope you will go on producing more course videos. I have learnt a lot with what I have watched so far.